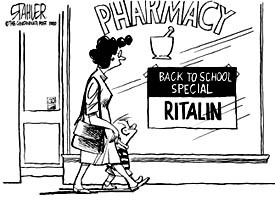 Parents of children with Attention Deficit/Hyperactivity Disorder (ADHD) are faced with many challenges. Often they have incredibly intelligent kids that won’t slow down, and behavior issues can make everyday life a battle of wills. Far too often, medications such as Ritalin and Adderol are prescribed without first examining some basic dietary issues that possibly exacerbate the issue. One of these is food additives, in particular, food dyes. One of the possible causes or contributors to this behavior has been a child’s diet. Many parents have reported that certain foods seem to make the behavior and impulse control worse. There have been extensive studies done as to the effects of certain foods and especially food additives that may cause a child who is ADHD to have even more trouble paying attention and sitting still. While there is no definitive evidence that this is a cause for the disorder, the studies indicate that it does have a negative effect on the existing behavior. Columbia University conducted a study in 2004 that examined and cross referenced the data from several controlled trials. The study couldn’t make specific recommendations due to lack of additional information about the test subjects, however it did show there was a distinct consistency with the responders and the research indicating artificial food colorings having a neurotoxic effect. The food dyes in particular to avoid are FD&C Yellow No. 6 (also known as “sunset yellow”), FD&C Yellow No. 5 (or “tartrazine”), D&C Yellow No. 10, and FD&C Red No. 40. The best rule of thumb is to always read the labels for the ingredients and avoid an overabundance of food dyes altogether. The list continues to grow as to what is being tested, so the less processed food in the child’s diet, the better. In another study done in 2007 at the UK’s University of Southampton showed in double blind placebo controlled testing that when sodium benzoate, a preservative in many processed foods was given to two different age groups, hyperactivity and inattentiveness increased. Considering the amount of processed foods in the modern diet, this is indeed a concern. Although this study indicates a particular preservative that may be making ADHD worse, more research is needed to determine what other food additives may have an adverse effect on behavior and impulse control. While it has not been determined at this time that these additives can actually cause this behavior, there is the possibility of pre-existing genetic factors that can make a child more prone to react adversely to these additives. Another study done at Southampton in 2010 studied the effects of histamine degradation in test subjects of similar ages to the 2007 research. These genetic variations, which are still being researched, may contribute to the different reactions children have.